Administrative Management Systems, Inc. (AMS, Inc.) has been asked to design and develop a personnel certification program for the Architectural Glass and Metal Technician population. AMS, Inc. shall serve as the Certifying Body and provide administration for the program. AMS, Inc. is a recognized leader in 3rd party certification in the glazing and fenestration industry. AMS, Inc. currently provides single contact coordination of certification, inspection and quality assurance auditing services between fabricators of fenestration products, and nationally recognized associations such as the Window and Door Manufacturing Association (WDMA), Safety Glazing Certification Council (SGCC), Insulating Glass Certification Council (IGCC), Insulating Glass Manufacturer’s Alliance (IGMA), and National Fenestration Rating Council (NFRC). Additionally, AMS, Inc. developed and administers the North American Contractor Certification Program (NACC), an initiative that provides certification recognition as a means of evaluating competency, business practices, and adherence to industry-accepted best practices for participating glazing contractors. It is believed that the NACC Program may compliment the future AGMT Personnel Certification Program. 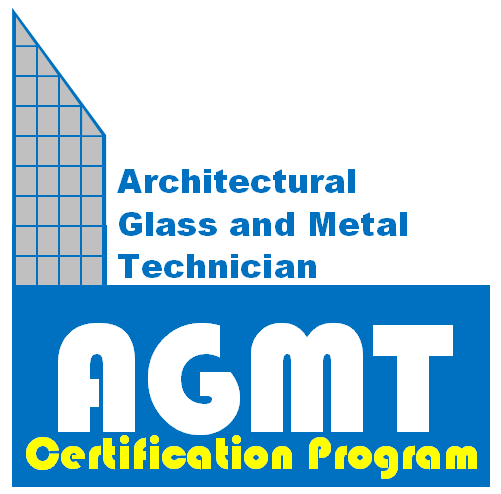 The AGMT Certification Program will be governed by a Certification Board that will make decisions regarding content and final design of the program. The board will consist of 12 to 18 members (TBD) with an equally weighted balance between glazing technicians, glazing contractors and the user community they serve. The user community includes Architects or Engineering Representatives, Construction Specifiers, Industry Consultants, Manufacturers/Suppliers, Building Owners or representatives, and General Contractors or Construction Managers. Board members will be selected through an application process. It is anticipated that there will be two to three board meetings per year during the initial phases of the development of the AGMT Certification Program. Once the program is in operation an annual meeting will be conducted to review and update the program. Board members will also have the opportunity to review materials and participate in conference calls periodically through the development process and after the program is in operation to provide input for the program. The development of the program will require seating 3 to 5 steering committees that will also be made up of an equally weighted balance of members from the three industry segments as above. It is expected that the steering committees may meet from 3 to 5 times throughout the development stage, plus conference calls as deemed necessary.